The gang of youths that Raph and Ninjara had battled in the previous issue inform our hot headed heroes that they’ve come to seek help for a friend. On cue, the mighty Sumo wrestler named Tattoo arrives and tells the Turtles that his pet chihuahua, Inky, has been taken hostage. The mob has threatened to kill the massive man’s best friend if he doesn’t take a fall in his next match – Tattoo states that he can’t lose the match as it will ruin his career. The TMNT vow to help him get his pooch back without having to throw the match. 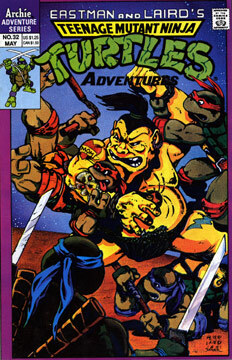 While Tattoo is engaged in his Sumo match, the TMNT, Ninjara and the Warrior Dragon infiltrate the mob headquarters and rescue the fiesty pup. Tattoo wins his match and the Turtles return Inky to his beloved master. The wrestler awards Leonardo a katana as thanks for saving his dog.